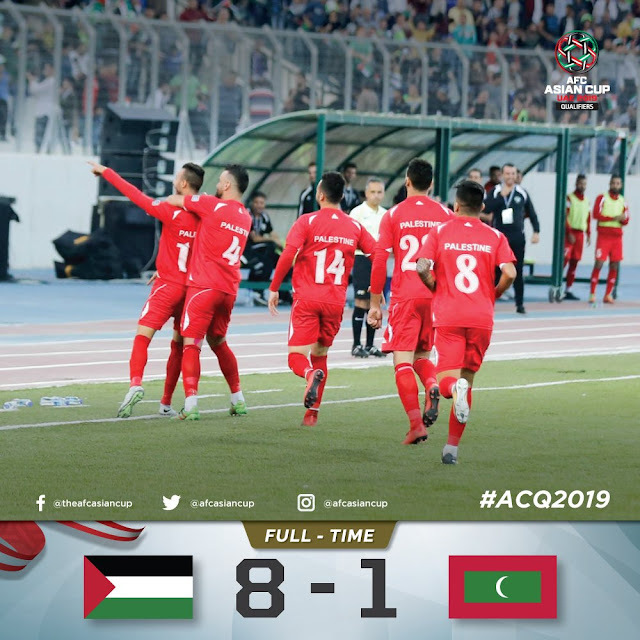 Recap: In yet another game on Palestinian soil, the national team scored early and pressed on to cruise to an 8-1 victory against Maldives. The game was held on the grounds of the Arab American University in Jenin- the first time the ground hosted the senior team. Debutant Mahmoud Yousef powered home a header from a Jonathan Cantillana cross after six minutes. Less than 10 minutes later, Haitham Dheeb doubled his goal tally from six inches out after Maldivian Keeper Mohammed Faisal spilled the in swinging corner kick. Sameh Maraba then drove into space on the left hand side of the pitch before dispatching a shot from the corner of the box that found the bottom corner of Mohammed Faisal's net. Yousef then became only the second Palestine player to score a brace on his debut. A corner kick was bounced off of Sameh Maraba's knee- teeing up Yousef to smash home the fourth goal. Maldives showed signs of life after the break scoring the fifth goal through Hassan Naiz. Palestine were caught sleeping on the goal and it was not a clean defensive performance by any means with Rami Hamadi contributing three to four quality stops to the cause. The Maldives goal sparked Palestine into life- Mahmoud Wadi had come close to scoring earlier in the half and although he was denied a debut goal his physical presence and great hold up play were on display throughout the game. Maraaba's second half hattrick of scrappy goals were bookends to a great goal by Jonathan Cantillana. Wadi and Awad both put efforts off the woodwork to ensure that Palestine would not reach double digit goals for the second game in a row. Palestine have now won all their games in 2017 and have won six straight qualifying matches an active winning streak bested by only powerhouses Germany and Spain. What I liked: Palestine went for the jugular and were rewarded, the crowd of just over 5,000 spectators were in full voice and Palestine can lay claim to having a real home advantage with four wins and five draws in nine games since readmission to FIFA. What I didn't like: Defensively, the performance was less than optimal and a better side would have punished us on more than one occasion. Palestine need to find alternatives to Bahdari and Dheeb as it seems that the duo struggles to cope with speed. There's going to be a lot of focus on the European based defenders called up to the Olympic side. Palestine have overhauled the entire side that contested the 2015 Asian Cup- there's a glut of forwards and midfielders that were once not even on the radar save for the defence. This needs to be addressed. Man of the Match: Jonathan Cantillana. A controversial choice given the goals that Sameh Maraaba notched but if we are to review the goals. It was Jonathan who set up the first, second, and third goals. He then won the corner and then delivered service for the fourth. In open play, he was simply unstoppable moving the team forward and creating space.